As I promised, here's my post about the cookery notebook of my grandmother. My grandma was born in 1915 and died nearly 29 years ago. That's one of the reasons that I don't remember her anymore. What's left are pictures and stories my mother tells me about her. I've already mentioned that I was organizing old photos during my stay at home in the Christmas time. 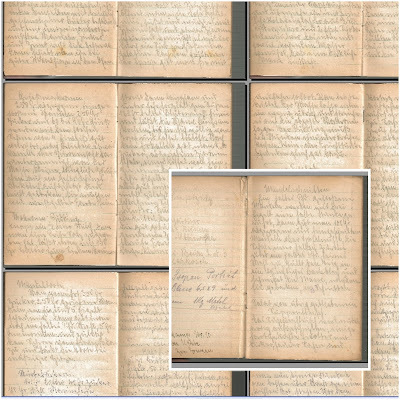 I found a lot of old documents as well - documents who are 70-80-90 years old. Some marriage certificates of my great-grandparents, my grandparents and so on. I also found a small notebook which I discovered was the cookery notebook of my grandmother (that's the one, whose parents had a bakery and pastry shop). It was amazing because it was written with a pencil and must be something from the late 1930s. How do I know it? There were some private notes from that time so I can say for sure my grandmother was writing in between 1935-1946. Is that not amazing? A piece of the own family heritage in a small notebook. After I read the notebook I found out that there are about 5 or six recipes for dishes and about 60 recipes for different cakes. So maybe I should call it the bakery notebook? Is there such a word in English? 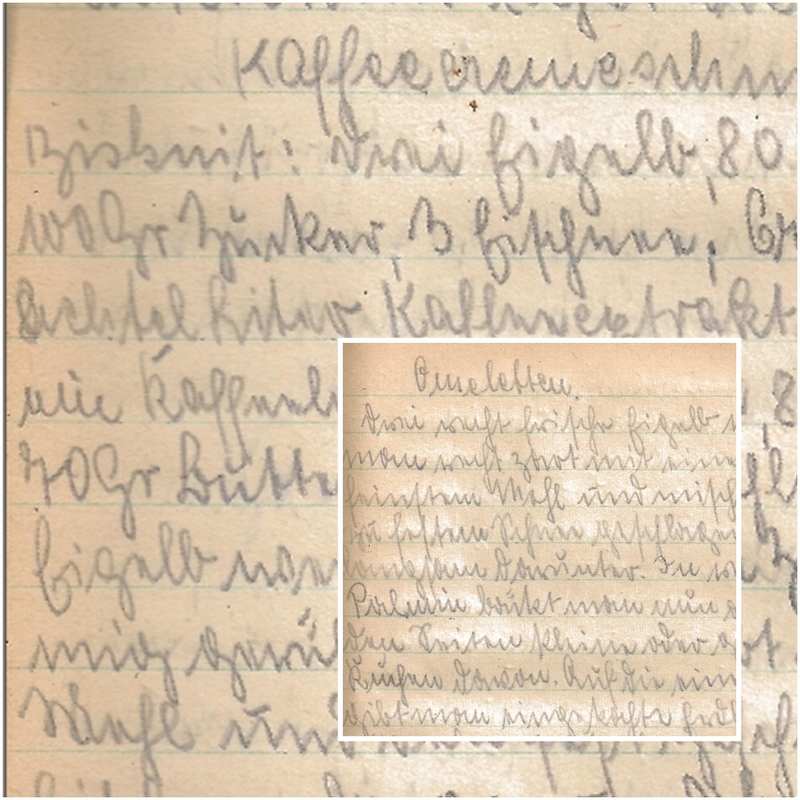 My grandmother wrote her recipes in the Kurrentschrift (Wikipedia) which was the style of handwriting Germans used opposite to the printed Fraktur (Wikipedia) alphabet. Both alphabets were used in Germany until the early 1940s after the Nazis introduced the Latin alphabet (Antigua) for regular use in German and banned the old style. But the handwriting survived much longer than its' printed equivalent. Sometimes I can still see it in the hand writing of some older people here. People of my age are not able to read the Kurrentschrift anymore without any training. It's like learning a new alphabet. After a I turned teenager I learned how to read and write the Kurrent. I already was able to read the old printed alphabet because it was something I grew up with and we own a lot of old books which survived the War and the past generations and are printed in Fraktur. So my first experiences with the Fraktur I made when I was a kid reading or trying to read some of the old books we had at home. 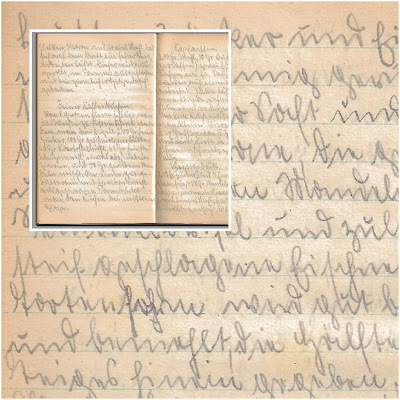 Later I made progress and now after reading a lot of books and documents printed in Fraktur it makes no difference to me anymore which style they are printed. Maybe I am a little bit faster reading the regular Latin alphabet but it's only a little bit. My first experiences with Kurrent were some old documents and notes I saw at the age of 12 I think. Later I wanted to be able to read and write it so I asked my aunt to teach me the old alphabet. Now I am thankful for that gift because I am able to read the cookery notebook of my grandmother. 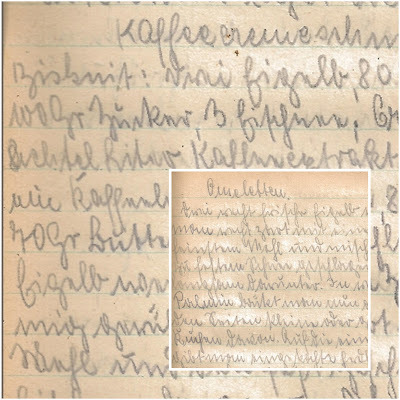 I don't have to mention that it's always harder to read someones hand writing - and so I must confess because of the own style in writing every writer has I am not always very fast in reading my grandmother's Kurrent. Sometimes I read a whole site without problems and sometimes I have to stop at a single word for a while to decode it. It's funny how times change - not to mention my mom, it's only one generation behind and how different we think, write and live now. But it's a big part of my own and our common German heritage as well and I can't wait to re-bake some of my grandmother's recipes. I am glad that I finally scanned the whole notebook to have it as a single PDF-document on my computer. So take a look on the pictures and let me know how you're going in decoding the recipes and ingredients.